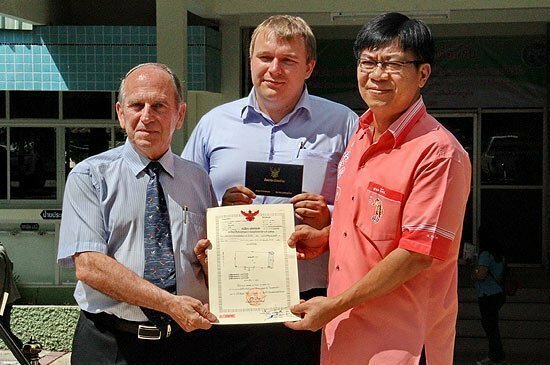 On 21st May 2015 French man Mr. Dominique Grosbois that is one of the buyers in Nai Harn Beach Condominium project get the Title deed for his unit from Mr. Somdao Laohakij, Chief of land Registration – Land Technical Officer Senior Professional level. Together with Title Deed registered on his own name Mr. Dominique Grosbois also received a Tabien Bann (house registration book which should be in every housing in Thailand). In the mean time CEO of developers company Mr. Igor Protasov was a witness of transfer of ownership. These is a good sign for Phuket when foreign expat who bought and paid for his condominium unit has a lawful right to be an owner of his condominium and properly receive his own title deed and Tabien Baan just same as other Thai people which live in Thailand. Mr. Dominique Grosbois is French men who retire from his job and now he is only 62 years old. Before his retirement he works in a big electrical engineering company in Bangkok. Due to his work he visited many countries around the world. By visiting the project for the first time he decided to buy a condominium noting that the project will be completed in January 2015. Also he was attracted by all the facilities provided at the project and close distance to the Naiharn beach. He did sign a purchase agreement in December of 2014 and paid in accordance with the payment schedule specified in the contract. In March 2015 he come to stay in Nai Harn Bach Condominium not as a visitor – he stay in his unit and in May 21st, 2015 as his final payment was done he got a title deed and Tabien Baan. “I love the beach so I love this condominium as well. In contract provided to me was very clear that they will finish construction at the end of January 2015 and they did it in time. As I bought a unit with furniture package when I came to stay my living was ready and fully furnished. My condo is very comfortable and all facilities make us filling just same like I stay at home. I am proud to be an owner of this condominium. During the payments developer really follows to their commitments and steps of construction later also interior design in my room. When it was done it is just same as I saw it in show room before. I feel very appreciate today and I want to let everybody know that Nai Harn Bach Condominium is condominium that is built for sales and now they are finished 2 buildings. I feel very happy with green scenery here and nearby Nai Harn Beach which is very quiet and clean. I wake up every day and walk to the beach. It takes me only 5 minute and it is very wonderful beach which you never see for sure. I also have condominium in Hawaii and other place but living in Nai Harn Bach Condominium you will get the fresh and clean atmosphere not far from Nai Harn Beach and same time in this area you have everything nearby. This is the condominium that I can recommend.” – Mr. Dominique said that. Moreover for this year Nai Harn Beach Condominium is nominated to The Best Condo Development (PHUKET) 2015. The results of “The best Condominium in Phuket” nomination in the competition of Thailand Property Award 2015 will be announced in upcoming September 2015. “Nai Harn Beach Condominium is one of the first projects in Phuket offering a true European design and functional accommodations with windows in all rooms. Each seven-storey building comprises only 2-4 units per floor making it almost unique project in Phuket. It’s located near to the Nai Harn Beach that is the only beach available for whole year safety swimming, even during the low season. The project includes two buildings with a total of 50 units including spacious 48 square meters studios, 71 square meters 2 bedroom accommodations and superb 118 square meters penthouses located on the top floors. It also features a large swimming pool, Café, Fitness Health Club, children playground and laundry service. Our units are ready to move in and transfer ownership today, and our management company will ensure a 24/7 security service and the daily cleaning of all public spaces including garden and pool. Guests will be able to book any kind of leisure service at our management office onsite. It will also assist the owners with short or long term rental of their apartments while they are away from Phuket.”- Igor Protasov, CEO of Nai Harn Beach Condominium said.